Welcome to the Fully Lived series (a great accompaniment to the Fully Lived podcast). As I've been exploring this nomad life, people keep asking where my favorite places are in each city I spend a decent amount of time in. Knowing this, I've decided to start a blog series highlighting my favorite haunts in cities that I spend at least a week in. 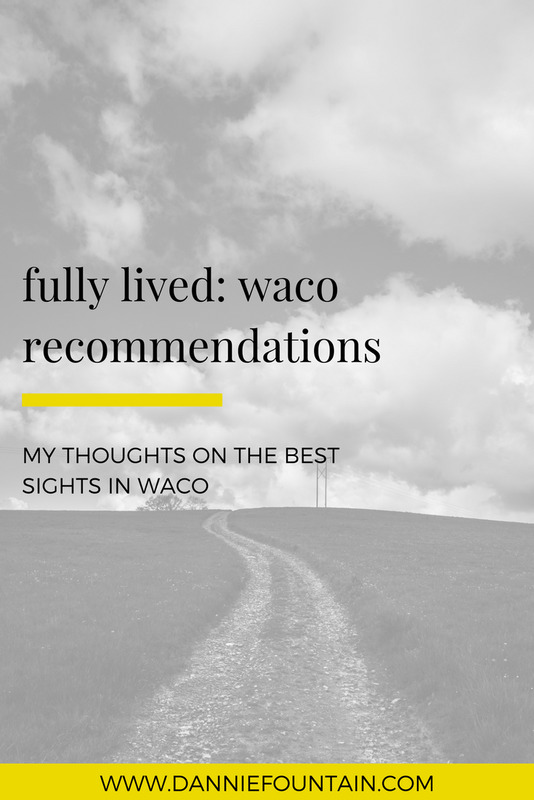 Next in the series is Waco Texas, a little town with big promise! These are the gems I fell in love with while in Waco. DICHOTOMY COFFEE + SPIRITS: I fell in love with this little charming spot when I needed a break from the hustle and bustle of travel. MILO BISCUIT COMPANY: These guys catered the Illume Retreat dinners every night and I couldn't have asked for yummier food! HEART OF TEXAS DOG HOUSE: I've been on a vegan kick lately but I broke that streak for this little food truck at the Silos. Worth every damn bite (and reasonably priced too!). HARP HOUSE: So, I stayed two places while in Waco but this was the only place worth recommending. My time in Harp House was so relaxing (plus the space is stunning!). I may have only had a couple days to sightsee but boy oh boy did I pack it in! WACO MAMMOTH NATIONAL MONUMENT - This place is actually awesome! I didn't come to Waco to see mammoths, but it was worth the (very quick) visit! BAYLOR UNIVERSITY – You can't go to Waco and not see Baylor! A cute campus, with lots of open air spaces for walking (and a few neat indoor spaces too). DR PEPPER MUSEUM - Okay, so full disclosure, I didn't actually go here, but being the Dr. Pepper addict that I am, it obviously made the list! MAGNOLIA MARKET – Surprisingly less touristy than I expected, though very "Disney" with the always clean, always happy, well-manicured look. It was beautiful though! HARP DESIGN CO - Seeing as I was staying right next door, I had to visit Harp! A cute little store with gorgeous wood made products inside. In need of more recommendations? Check out Bonnie's post. Real life entrepreneurial money launderer. The only pair of shoes I own.